It was inevitable really. Food blogger meets master brewer-in-training and the result had to be either a food and beer pairing or even better, beer *in* the food. Don't think I missed those ears perking up there at the back... So far I've added beer to pasta, chocolate cake, mussels, an Irish coddle and now, soup. This was my second attempt at mushroom soup (for Winter '11 at least) and while the first attempt wasn't bad (really, not bad at all), when TheHusband couldn't stop raving about his latest brewing success it seemed like a no-brainer to incorporate his brown ale into firstly the mussels of Sunday night, then the mushroom soup of last night. My method had little rhyme nor reason, I'll be the first to admit. It was more a case of 'hmmm lets try a few glugs of this and see how it goes'. The soup didn't need much more - a touch of nutmeg and paprika and a generous helping of fried bacon* stirred through - it was a done deal. *because bacon makes everything better, didn't you know? The beer adds lovely depth of flavour and this particular brew (a brown ale) seems to emphasise the peppery notes of the seasoning. 1. Add potatoes to a pot of boiling water and cook (skin on) until tender. Alternatively microwave until cooked through. Set aside to cool down, before peeling. 2. Meanwhile, heat oil in a large pot over medium-high heat. Add onion and garlic, sauteeing until the onion is glazed and looks almost see-through. 3. Add mushrooms, water and beer, bring to a boil and cook until mushrooms are soft. 4. Lower heat, break potatoes into chunks and add to the soup mixture. Puree with a handblender, then stir cream, paprika and nutmeg through. Taste and adjust seasoning accordingly. 5. Heat a little bit of oil in a separate small frying pan over high heat. Add bacon to the pan and fry until lightly crispy. 6. Reheat soup until warm, then stir most of the bacon into the soup, reserving a few pieces for garnish. 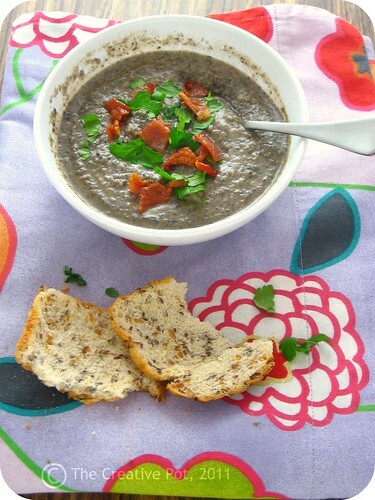 Ladle into soup bowls, topping with the reserved bacon bits and chopped parsley. beer in soup is a no-brainer! Especially if you have a brewmaster living in the house. Then it's just necessary! Looks like real warming winter fare, rich and sumptuous! It's good for the diet .. nice idea .. Very interesting recipe. It's first time I'm seeing beer in a soup. It'll be fun to try. Thanks for sharing. It certainly is soup season with this cold spell! We've been eating litres of the stuff. Ruby - As far as I know a lot of the alcohol evaporates during the cooking process, but I really have no clue how much alcohol remains. If you're very uncomfortable with your son ingesting any alcohol I'd suggest using a non-alcoholic beer or even just substituting with water - you might have to slightly tweak the spices until it tastes just right. PS: love your blog! If I go vegan, the things I will miss the most: bacon, cheese and fro yo. Because yes, bacon does make everything better! yummy! a soon as it stops being 100 degrees out, I am going to try this recipe out. pretty much anything I have ever tried that includes both beer and bacon has been a winner for me. Oh so true - bacon really DOES make everything better, LOL! Love the flavours in this soup - beer is great to cook with and there is such a variety of styles available, from fresh and light to really quite rich and heavy.